Stark Raving Cat Catnip Joints – Not legal in Illinois? You are here: Home / About Cats, Catnip and Cat Toys / Not legal in Illinois? Oh Emmett – that’s not legal in Illinois! @laughingsun sent some of these kitty joints to me – and they were immediately misplaced! I found one today and Emmett was a happy boy. Stark Raving Catnip Joint Sighting! 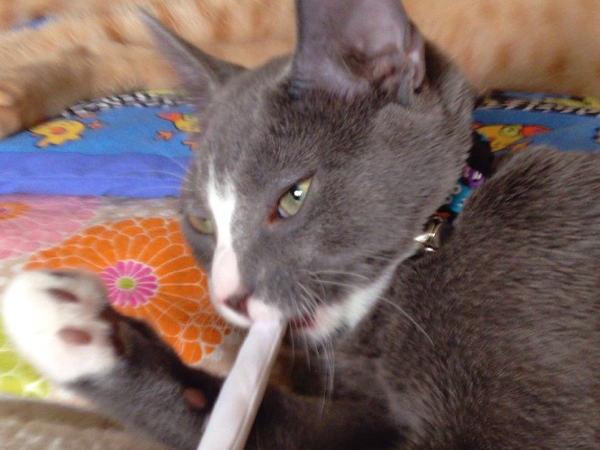 And just to clarify: Catnip Joints ARE legal in Illinois, and all 50 states!